The volumetric changes of concrete structures due to the loss of moisture by evaporation is known as concrete shrinkage or shrinkage of concrete. It is a time-dependent deformation which reduces the volume of concrete without the impact of external forces. Plastic shrinkage occurs very soon after pouring the concrete in the forms. 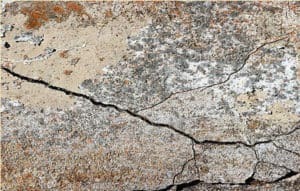 The hydration of cement results in a reduction in the volume of concrete due to evaporation from the surface of concrete, which leads to cracking. The shrinkage that appears after the setting and hardening of the concrete mixture due to loss of capillary water is known as drying shrinkage. Drying shrinkage generally occurs in the first few months and decreases with time. Carbonation shrinkage occurs due to the reaction of carbon dioxide (Co2) with the hydrated cement minerals, carbonating Ca(Oh)2 to CaCo3. The carbonation slowly penetrates the outer surface of the concrete. This type of shrinkage mainly occurs at medium humidities and results increased strength and reduced permeability. Autogenous shrinkage occurs due to no moisture movement from concrete paste under constant temperature. It is a minor problem of concrete and can be ignored. The shrinkage of concrete depends on several factors which are listed below. shrinkage is mostly influenced by the water cement ratio of concrete. It increases with the increases in the water-cement ratio. It is one of the major factors that affect the total volume of shrinkage. Shrinkage is mostly occurred due to the drying condition of the atmosphere. It increases with the decrease in the humidity. The rate of shrinkage rapidly decreases with time. It is found that 14-34% of the 20 years shrinkage occurs in two weeks, 40-80% shrinkage occurs in three months and the rest 66-85% shrinkage occurs in one year. Aggregates with moisture movement and low elastic modulus cause large shrinkage. The rate of shrinkage generally decreases with the increase of the size of aggregates. It is found that concrete made from sandstone shrinks twice than the concrete of limestone. The shrinkage increases with the addition of accelerating admixtures due to the presence of calcium chloride (CaCl2) in it And it can be reduced by lime replacement. The type and quantity of cement. Granular and microbiological composition of aggregates. The dimension of elements etc. The information are excellent and very subjective. quite good for all CIVIL engineer to understand as language is easy. I really love this. Very Informative! thanks for this sharing information.